Our friends at The Illustrated Mom are bringing you this nifty giveaway! I love this thing! I think we need one for ourselves here in the Sweet Cheeks home! Good Luck and don't forget to check out her full review! If you are like me, you are prone to losing things, a lot! I am pretty sure I would have lost my own head long ago if it wasn't attached. 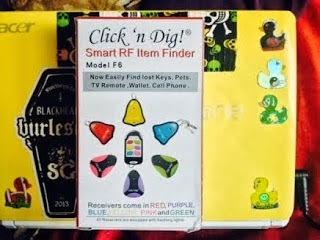 I had the opportunity to review the Click N Dig Key Finder previously, and now I get to give away a set to a lucky reader! Please check out the full review I did HERE. Enter using the entry form here! Disclaimer: The Illustrated Mom and Sweet Cheeks and Savings are not responsible for prize fulfillment. Click 'n Dig Key Finder is responsible for prize fulfillment. Contest will run from 1/27/2014 at midnight through 2/3/2014 at midnight and then winner will be chosen at random. Winner will have 48 hours to respond to email they receive or a new winner will be chosen. I would like to put it on my phone, always losing it! I would probably use it on my husband's keys...and anything else I could! I would use this on my keys, or purse.